As I said earlier, the idea to explore the Great Alpine Road came to our minds in November 2013, but we were extremely busy till the end of January. Luckily, there was a public holiday (Australia Day), so we invited our friends to hit the road together! Our first stop was in Alexandra, small town where we stopped to give to kids time to play on a playground. 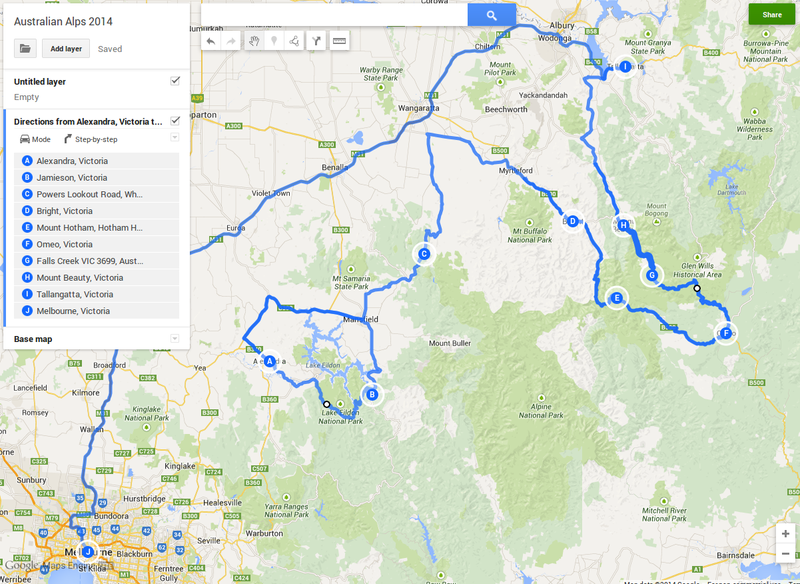 The next stop was near Lake Eildon lookout, and then at Jamieson Brewery near Mansfield. The beer was perfect, the lunch was tasty, although we had to wait it for almost an hour (hint - be there before the the lunch-time, not after it). Someone suggested make a shortcut and get to Bright faster by following 4wd tracks. We went to the Powers Lookout - place, where it is believed a vantage point for bushranger Harry Power was to view approaching troopers during his period of notoriety in the north-east in the 1860s. Unfortunately, after the Powers Lookout we couldn’t follow 4wd tracks any longer, as there was too much water on the road. We went back to the sealed road, made a stop at Bright to get some fuel and went further, to the Mt Hotham, where we planned to spend a night. You might ask me - why do you guys went to the Mt Hotham, instead of staying in Bright or Harrietville? The answer is simple. We had a plan to climb on Mt Feathertop - the second highest mountain in Victoria. To do this we had to be to the start of a hiking trail as early as possible and the nearest campsite was the J B Plain camping area. The night at the campsite was cold, really cold. Luckily, we were prepared for such temperatures, so in the morning we were fresh and full of strength to climb on Mt Feathertop. Day 2. Mt Feathertop - Omeo. Tired and and exhausted after the climb, we went to Omeo - nice small town on the Great Alpine Road. Our friends were waiting for us at the camping near the Omeo Hwy (I couldn’t remember it’s name, sorry, guys). We spent a night there and went by Omeo HWY and then by Bogong High Plains Road further, to Falls Creek. After the Mt Cope, the Bogong High Plains Road becomes wider. It was a real pleasure to drive there - the views of Alps were stunning! There are some good walking tracks to huts, but as we hadn't had enough time (as usual ))), we made a short stop near Falls Creek (Rocky Valley Storage Lake) and then went to the Mt Beauty. After an Indian lunch, it was time to go home. On our way back we made a stop at Tallangatta - ‘the town that moved’ (I will write about it later) to have a look at the Hume lake and Hume Dam. We were back in Melbourne when it was dark. It was a loooong, but a good trip. Thanks, friends, for your good company!